I’ve got a couple of questions from readers asking about how to style my hair. To be honest with you, I usually don't spend a whole lot of time on it. I lost quite a bit of hair after my daughter was born. Using a flat iron everyday to straight my hair doesn’t help either. I am really trying to stay away from heating tools but it’s tough. My hair is naturally wavy and I do not like it. I love straight and sleek hair. The only way to accomplish that is to use a flat iron. Because I straight my hair every day, it’s very crucial for me to invest in a good flat iron. I was given the opportunity to try out the HANA Titanium 1.5 “ Flat Iron sold by Misikko a few months ago. I really wanted to test it out for a longer period of time before writing a review. Before having this flat iron, I’ve been using the Her Styler hair straightener for almost 10 years. It was about time for me to get a new one. - My iron was shipped the same day and arrived 2 days later. Everything was very well packaged. The flat iron came with a travel pouch, a heat pouch and a small bottle of Hana Shine Shield. - The flat iron has several heat settings to choose from and heats up much faster than my old one. It is ready to go in about 30 seconds. It saves me a lot of time getting ready in the morning. It is extremely light weight and easy to use. - I can curl my hair, flip my hair or just go totally straight using this flat iron. I don’t really have any concerns about this product. - If I have to criticize, it would be the long cord. The cord get twisted easily for some reasons. The retail price for this flat iron is a bit steep at $179.99. However, it is still in the price range compare to some of the other professional flat irons on the market today. Overall, I am quite happy with this product and would recommend it to someone who is looking into purchase a professional flat iron. Wow! What a difference!!!! Great review Sydney! What a great review and your hair looks amazing! Your hair is GORGEOUS! It's soo black .. like my mom's. My mom is the only one in our immediate family to have pure pure black hair. I hope you never dye it because it's gorgeous!! : ) Even my natural hair colour isn't as dark as yours. I agree about the long cord. They sent me the blow dryer and that was one of the things I complained about as well. Thanks for the review Sydney, I really need to start styling my hair. I usually let it airdry and then just put it up in a messy bun. It's a frazzled look. Your hair always looks incredible! 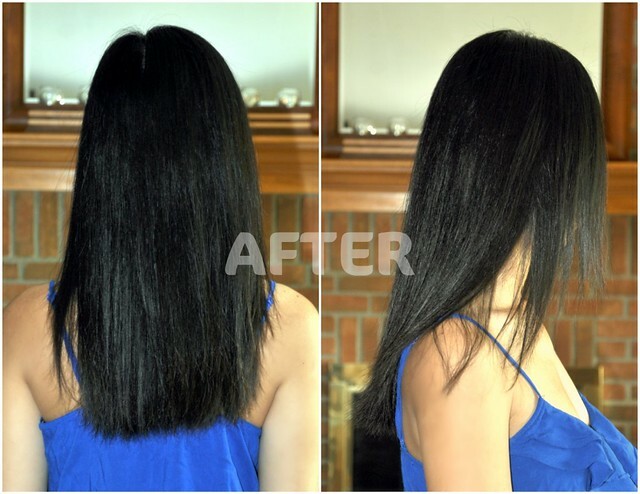 your hair looks great straight or curly! you did a great job on the review. i love my hana flat iron and blow dryer too. i use mine everyday! 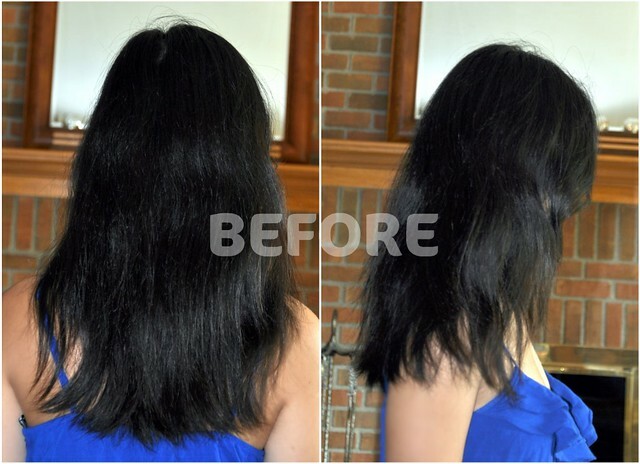 Love the review - I would have never guessed you had wavy hair! I admire your persistence to straighten it every day! Wow. Very sleek and shiny. Love it. I agree it is on the pricier side. Groupon had a deal for a Sedu straightener for I think was $60 and that one is excellent as well. Sydney, what a difference in the before and after! If you would believe it, my hair is even frizzier than your before. Most days I don't bother and just pull it up. Your after styling is giving me hope though! Love the hair! The same thing happened to me after I had my kids - my hair would fall off in clumps. I never found out why either. In any case my hair is naturally stick straight so I would have to flat iron curl it once in a while, I usually try the cheap drugstore kind and its taking a toll on my hair. Might have to give this product a try. Thanks for the review! Your hair looks sooo good and shiny too! Beautiful blue shirt too, love the ruffle. thanks for the great review there ! what a huge difference a good flatiron makes!! my hair is naturally wavy too and i used to flatiron every single day. but lately i've resisted the urge and have found that the Aveda Smoothing Elements serum works well enough to straighten my hair so that i can avoid straightening it. it's really helped my hair grow out much longer!